The Bulldogs go into the 2018 season with two top-tier talents at the quarterback position but a very small amount of depth. 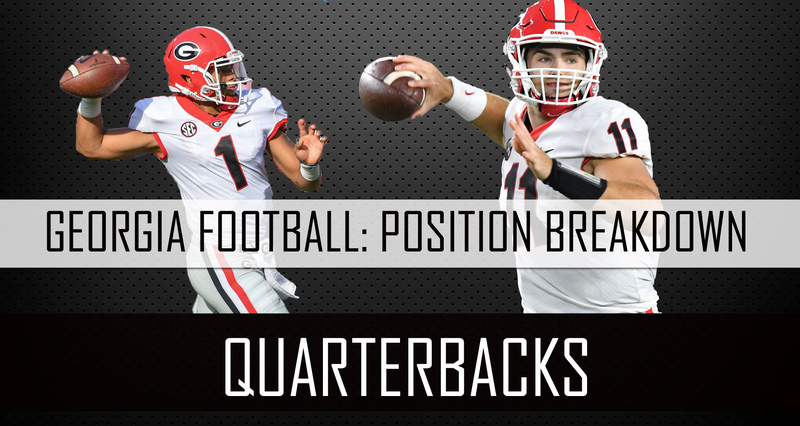 With Jacob Eason and Stetson Bennett on their way out the door via transfer, Jake Fromm and Justin Fields will have to shoulder the workload at the quarterback position. Fields, an uber-athletic five-star prospect out of Kennesaw, Georgia has media buzzing about his potential and talent. Fromm is all but confirmed as the starter after a monumental freshman season, but after leading Georgia and its fans to heights they haven’t reached in ages, there will be more pressure than ever to win that elusive national championship. Fromm’s stellar 2017 campaign saw him throw for 2,615 yards and 24 touchdowns with a 62.2 completion percentage. Fromm also posted a 160.1 passer rating and by all metrics had one of the most productive seasons for a freshman quarterback in SEC history. However, beyond the stats, what stuck out in Fromm’s inaugural campaign was his poise and leadership. After Eason went down, Fromm stepped in and led the offense without missing a beat. Fromm methodically picked apart some of the best defenses in the SEC. He managed to steal a win in South Bend and keep the Bulldogs CFB playoff hopes alive. But maybe most impressive, after getting rocked by Auburn at Jordan O’ Hare stadium, he came back a few weeks later and tore apart that very same Tiger defense en route to an SEC championship. In college football a quarterback’s mental ability to stay focused and poised can be far superior to sheer arm talent. Fromm showed that not only that he was a leader last year, but that he is an excellent game manager. Fromm knew to trust the elite skill players around him and was extremely efficient when it was his turn to shine. That role will most likely be similar this year as he can rely on his surplus of skill players around him, like D’Andre Swift and Mecole Hardman Jr. The Bulldogs are in good hands with Jake from state Fromm, but there will be pressure with such a talent behind him. Fromm will have to win games and look good doing it or Kirby Smart will start to feel pressure to give Fields a look. Fields shocked the college football world by picking the University of Georgia, despite at the time already having two five star quarterbacks on the roster. Since then, Eason is out and Fields finds himself one play away from being under center in Athens. Field’s traits at the position are something Georgia has seen glimpses of in DJ Shockley, but his arm talent mixed with his speed and agility are what truly separate him. The number one player in the country coming out of high school, Fields has a knack for making big plays both in the air and on the ground. Dual-threat quarterbacks are exciting, they are insanely fun to watch and make some of the most electrifying plays in college football. However, they have also been a big component of recent championship teams winning the title. Deshaun Watson, Cam Newton, Tim Tebow, Jalen Hurts/Tua Tagovailoa, Cardale Jones/JT Barrett, and the list goes on. The quarterback position in college football is dominated by these athletes because they add another dimension to the offense that defenses have to plan for. Nick Saban has shifted to this style of offense, Clemson and Ohio State both have largely used it in recent years. Georgia secured a player with that caliber and skillset. Smart could look to evolve the offense and add that dimension with him as soon as this year. Fields’ talent wont go underutilized, Georgia fans will more likely than not, see Fields in some kind of sub packages early on in the season. (Especially with the NCAA’s new redshirt rule) The pressure from Fromm and offensive coordinator Jim Chaney will come if and when Fields reels off some of those electrifying plays. Having two talented quarterbacks like Fields and Fromm puts Georgia in a great position to build on last year’s championship run. In the case someone gets injured, the other one will be ready right away to step in. Smart gave Georgia a taste of what they have been missing for the last thirty years, and now there’s no going back to mediocrity. You can bet that if one of these two gunslingers don’t produce, the other one will be ready and waiting to take over. All that being said expect Fromm to start and play well over the majority of the snaps this season, barring injury. Fromm projects to be one of the top quarterbacks in the SEC. At the same time, expect to see some flashes of greatness in Justin Fields. It should be exciting seeing these two different skill-sets work together in the classic city.